DAMASCUS, April 14, 2014 (Zenit.org) – An Armenian friend on Facebook alerted me to the tragic story of Kassab, Syria: On March 21, Sunni rebels violently expelled around 2,500 Armenian Christians from their picturesque and historic town. Early that Friday morning, Kassab was violently attacked, its churches desecrated, its families driven out. Since then, Al Qaeda-affiliated terrorists have occupied the town’s abandoned homes and businesses. A large number of the terrified residents fled – mostly on foot – about 35 miles to Latakia, a Syrian Army stronghold. With a sizable Christian population, Latakia has struggled to provide them with shelter and sustenance. The image of frightened families running for their lives with their children, their elderly and their disabled is the stuff of nightmares. Although much of Syria’s Christian population is comprised of Syriac, Maronite and Eastern Orthodox believers, some 70,000 Armenians have long been part of the faith’s colorful tapestry. And though they have received little attention during the country’s civil war, thousands have had to flee, some 10,000 to Armenia itself. Particularly infuriating to Kassab’s displaced families was the report that Turkish soldiers, who were supposedly guarding the nearby border, did nothing to stop the invading rebels. The Turkish government adamantly denies complicity in the attack on Kassab, but Armenians have not forgotten historic massacres at the hands of Turks, who decimated their communities in the early 20th century. Kassab’s residents were not only expelled from their homes in 1909. They were driven out again in 1915, during the infamous genocide, when as many as 1.5 million Armenians were killed. The image of frightened families running for their lives with their children, their elderly and their disabled is the stuff of nightmares. And for me, that scenario was particularly disturbing, because I was already focused on an eerily similar story, but from another time and place. As the Kassab reports began to emerge, I was reading the oral histories of two young Polish Jews, each of them fleeing, on foot, from the Germans in the early 1940s. My interest in these Jewish teenagers was personal. One of them became a physician in America. Only recently had I learned that, as a youth, Dr. Joseph Rebhun jumped off a train to Auschwitz, was shot in the head and somehow survived. His story mattered to me because, years later, this same Dr. Rebhun saved my life in a California hospital. The other young refugee whose story I was reading would become his wife, Maria. In their separate accounts, each of these young Jewish survivors described the terror that gripped them while running from German bombs and hiding from live gunfire. They spoke of summoning all their strength to help weakened siblings and elderly parents to a safe haven. They related the desperation of mothers carrying infants while struggling to protect toddlers. As I read, I breathed in the grateful thought, Thank God those terrible days are over. Then I heard about Kassab. Clearly, such terrible days aren’t over at all. Not for Syria’s war-ravaged population. Not for Kassab’s Armenian Christians. Not as long as there are bloodthirsty killers inflicting devastation anywhere in this troubled world. As these stories interwove in my thinking, I recalled a famous quote from Adolf Hitler. On April 24, millions of Armenians worldwide will, indeed, speak of that annihilation. Genocide Memorial Day takes place every year on that date, in remembrance of the million and a half victims who died between 1915 and 1923. In Yerevan, Armenia’s capital, hundreds of thousands will carry flowers to be placed around the genocide memorial’s eternal flame. This year in particular, as April 24 approaches, maybe we should make a point of remembering the Armenians. And the Jews. And Kassab. Along with lighting a candle in the window, as we offer up a prayer for a better world, perhaps we should also quietly repeat that simple vow: never again. The story of Abraham is not only seminal and foundational, but very interesting and full of typology and lessons for our own day. 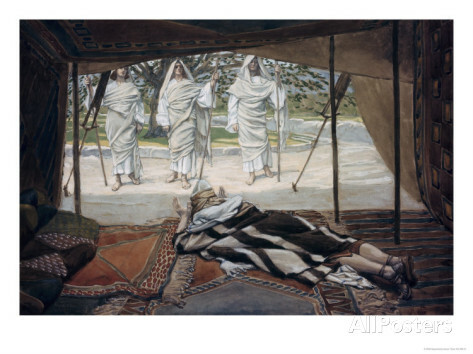 I just finished the section of Abraham’s hospitality when visit by unknown strangers who the Church sees as the Trinity coming down to visit Abraham. I think it was to meet the man on whom the whole story of salvation is built. Now Isaac has just been born and weaned at about three years old. With infant mortality at about 30% it is a time of great rejoicing. A weaned child has survived the fragile stage of infancy and can now eat solid food rather than breastfeed from his mother. 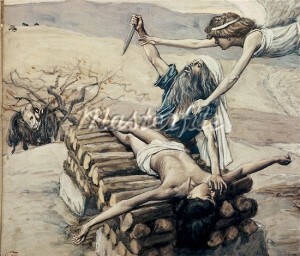 Next God is going to demonstrate what it was like for Him to give his only begotten Son whom He loved – as a sacrifice. We will see the drama played out in real human history in advance when God tells Abraham to go up Mount Moriah to offer up his only begotten son whom he loves. Ah, what a scene this will be in our new movie! Pray for me. Time is short, the pressure in on. We will be leading pilgrimages to Rome and Israel and then spending the month of June in Israel and Turkey filming the rest of this movie (we shot the scenes in Iraq in January).